Interhome Construction Inc. is a family owned and operated commercial construction company established in 2004. We are proudly serving the Toronto & GTA community with exceptional quality commercial construction and commercial renovation solutions for over a decade now. We specialize in commercial contracting, general contracting, commercial renovations both exterior and interior, home additions and build-outs. No project is too small or large for our commercial contractors in Toronto. We believe that where there is a will, there is a way and promise to deliver you customized construction and renovation services. When it comes to work ethics, we are dedicated to never cut corners on the work that we undertake. No matter, what the situation is, we will never mislead you about the progress of the construction project. We are experts at delivering quality services by using best-in-class products and equipment. Our prices are fair and transparent with no hidden costs. Trustworthy and friendly are the two qualities our each and every staff member possess. What Makes Interhome Construction Inc. Unique? 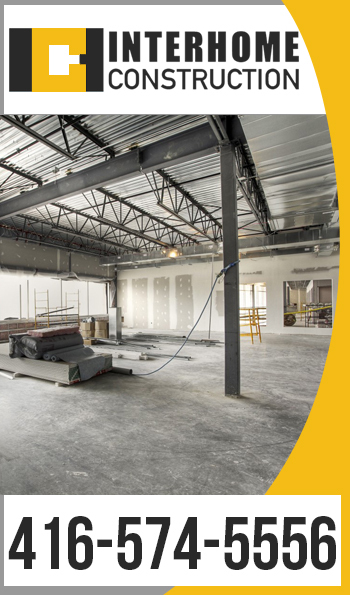 Whether you’re considering a commercial renovation or home addition project, with our commercial general contractors in Toronto, you can rest assured as your property is in the best hands. For over a 15 yrs we are happily assisting clients throughout the GTA and surrounding areas with every sort of commercial remodeling project. Our ultimate goal is to ensure that you are satisfied with the work we do, no matter the job is small or large. We stand behind our words and stick to your desired budget. Call Us Today To Know More About Our Services. Interhome Construction is a leading commercial renovation service provider in Toronto providing an array of office construction & room addition services. Call us to get a free quote. Copyright © 2017 Interhome Construction. All Rights Reserved.